So I was sitting on a United Airlines flight to Florida the other day. I learned that United Airlines is outfitting their entire fleet with wireless access. I remember reading an article about this a few years ago. My initial thought was that this is another way for airlines to extract an extra $10 off their passengers that want to do email while in flight. However I did not think about what United may have been thinking when they first made the announcement. 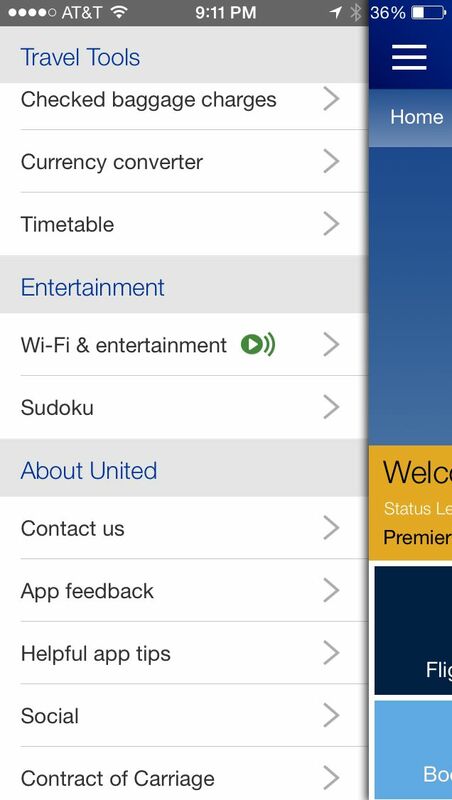 It turns out that United is rolling out a service called In-flight Wi-Fi and Entertainment. You can see it on the attached screen shot from my phone. It’s just above the Sudoku option. You can typically activate wireless on your phone while in airplane mode so after you do that, bring up the United Airlines application. Selecting the Wi-Fi and Entertainment option will get you into the usual terms acceptance. You then are asked if you are ok with participating in their beta program for entertainment inflight. It isn’t clear on how long this beta will last or if they will charge for it once it goes mainstream. Viewing options are the typical reruns of network TV shows from ABC, FOX, NBC and CBS. They also sprinkle in some 10 year old movies. I don’t think I would pay for this, but if they include some current shows or DirecTV, I might pay. Once you start watching, no doubt your arm will being to hurt or fall asleep and you will wish you had a way to keep your tablet at a nice angle for watching movies without having to hold it. We have preciously posted some ideas that work well on phones and you can read it here. We present some nice options for resting your tablet on the snack tray or even strapping it to your leg. It seems to make sense that airlines are heading in this direction. I suspect other airlines are doing the same. I live in New Jersey and if you are flying out of Newark, United Airlines is typically the best choice as it’s one of their largest hubs. The cost of integrating monitors into every seat back is costly. The price of providing a large Wi-Fi pipe on a plane is significantly lower. Everyone has an iPhone or tablet on board so why not take advantage of that fact and integrate airplane entertainment into that experience. I think the biggest challenge for United Airlines will be how to provide varied current content over their inflight wireless system while providing an experience that like the one you have at home. I have used wireless for connecting to the internet on a plane. it was so bad that I actually wrote United and asked for a refund. However my experience with the wireless beta which no doubt did not connect to the internet but to the plane’s local area network with the content coming off their in-flight server was good. The video did not skip and I was able to watch several different shows without a problem.